I ordered the effects starter kit today [+ an extra LEC, 24" Extension Cables and 2 Warm White LED Strips]. Pretty excited but I have a couple questions as I wait for my order to show up. All my lights will be on Technic vehicles. 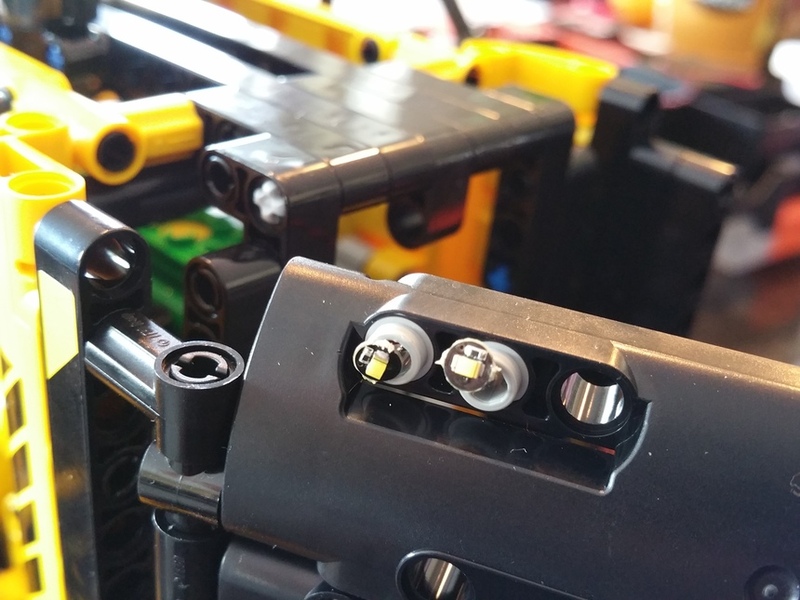 Are there any tricks for mounting the batt box in Technic? I didn't order the PF cable but thinking now maybe I should. Another question on the LEC's is do they hold the settings when switched off? So the battery on button is a master switch? Just thinking if I bury the LEC's. Are the cables "stiff" as in can I kinda mold them in place? 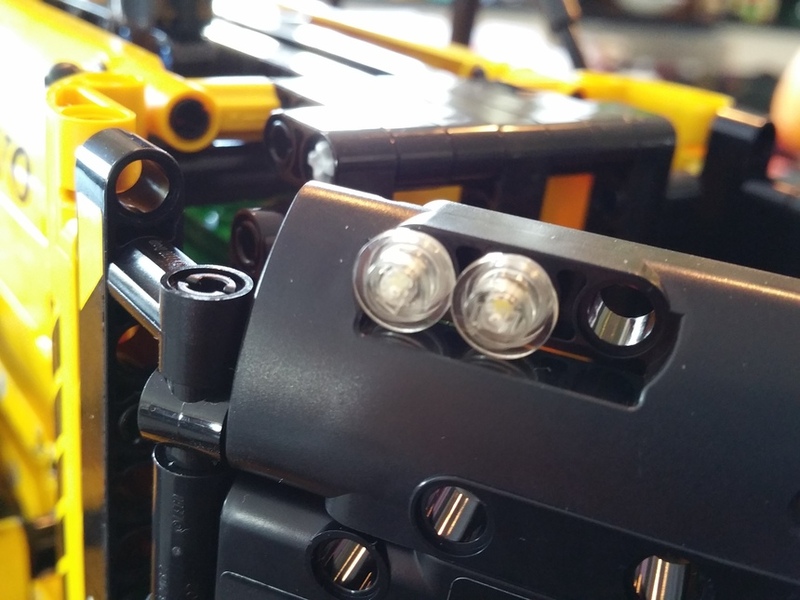 Any other tricks for using these lights exclusively with technic? Is there a way to make something similar to the 8 LED Topbar Demo with 2 LEC's? Thanks for any and all answers. I'll be sure to take some pictures when I'm setup! Hello and thank you for your post and for being a customer! 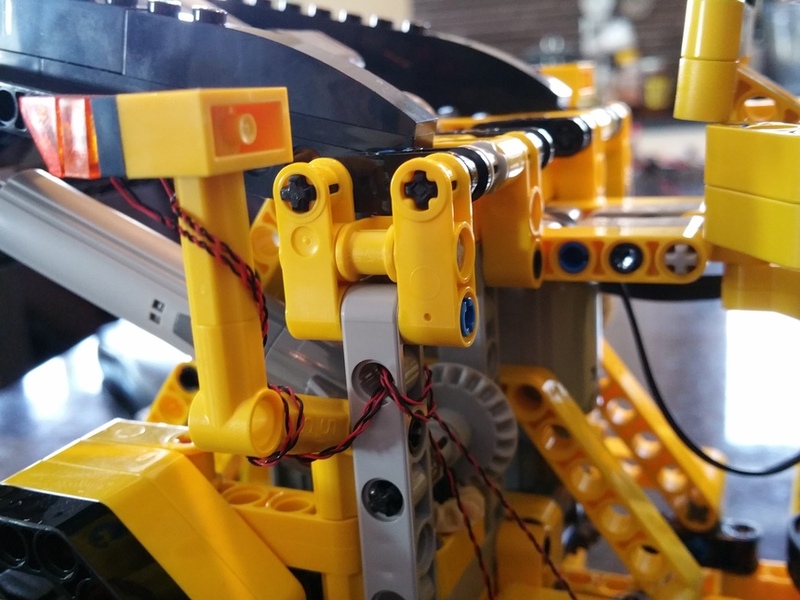 You asked about any tips to mount the battery box inside Technic vehicles. In general, no specific tips, though a rubber band or two may help keep the box in place against the frame. 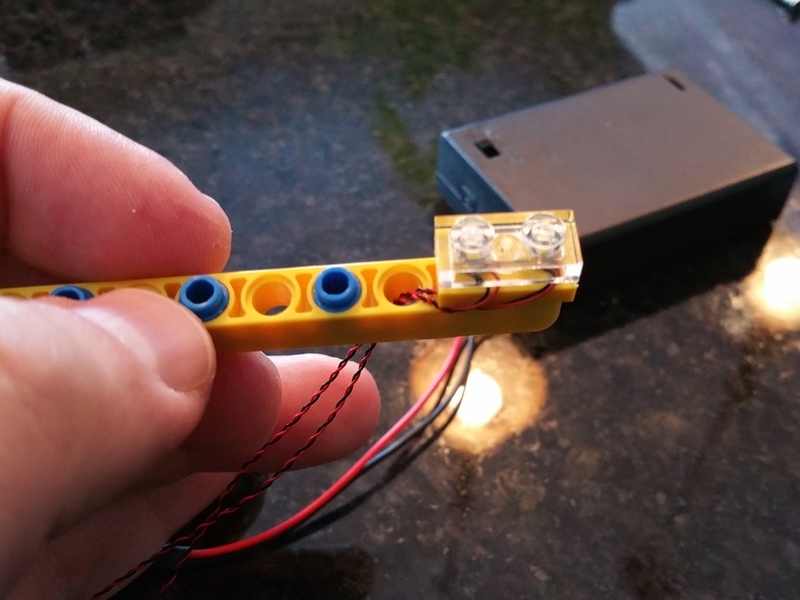 You can also make a bracket for the battery box using extra Technic beams you may have on hand. 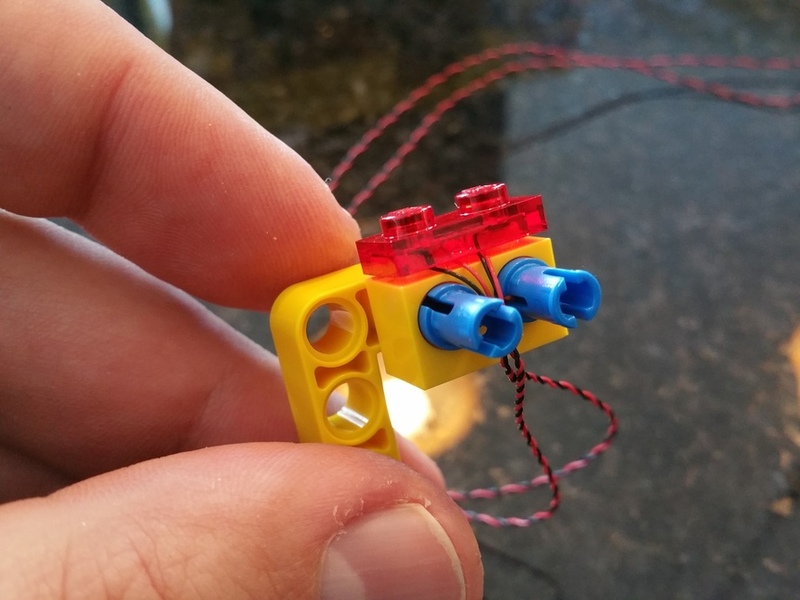 Using a Technic half-pin and round clear or colored plates on top of the half-pin. 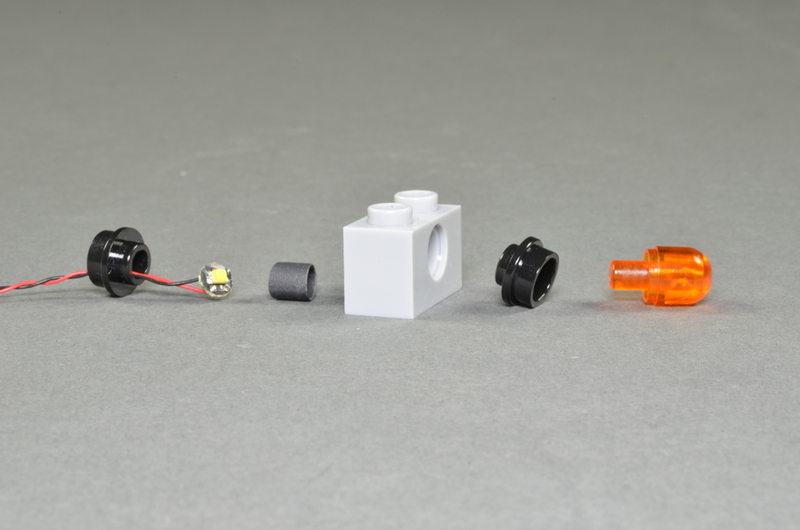 This mounts the LED on top of the Technic element. 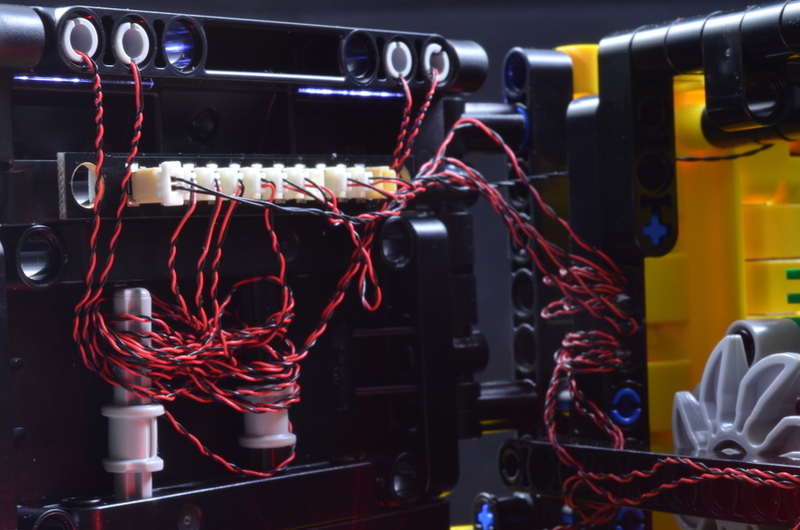 Placing the LEDs directly under clear or colored plates. Using a round 1x1 plate with hole to mount the LED on the back of of the Technic element. This method works really well, though you do need to use plates on the top, not tiles (there isn't enough room under the tile for the LED and circuit board). With this method, the clear or colored plate sticks up a little bit, but this is barely noticeable when looking at the finished model. 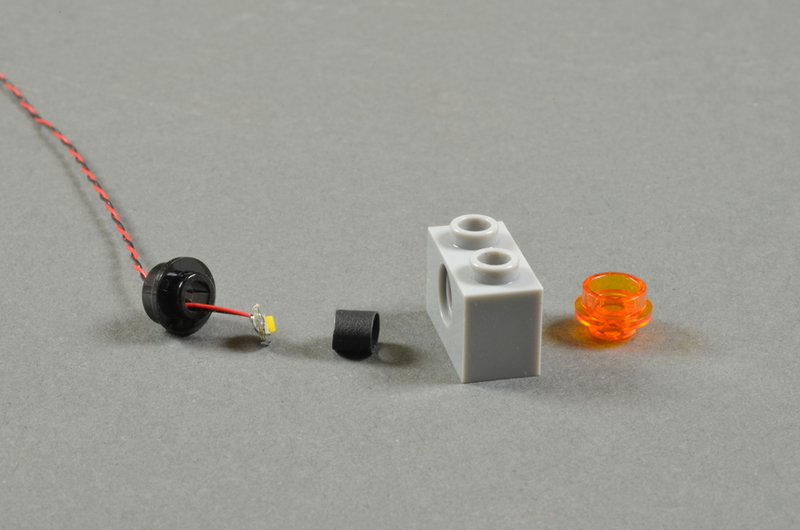 The top photo shows the LED being mounted behind a round 1x1 orange plate, while the bottom photo shows how to mount the LED behind an orange light cover with pin. In both photos, the round black plates are the ones with holes (part number 85861). The little black tube is something we've been testing to keep the light from shining through the sides of the Technic part. This is helpful when working with lighter-colored Technic beams and bricks, but isn't needed when working with darker beams and bricks. I'll go ahead and include some of these tubing sections with your order in case you need them. Longer-term, we're probably going to be selling some mounting kits that include both the tubing sections and the round plates with holes. I hope this information is helpful for mounting your lights inside Technic elements-- let us know if you have any additional questions. And make sure to post photos of your final project when complete! For the LEC, yes it does retain settings even when the power is turned off, so you don't need to access it every time to re-program the settings. Hopefully these photos help give some ideas. You can also find more photos in our Flickr feed here, here, or here. Regarding the topbar, we're looking at making this an off-the-shelf part. Stay tuned! Thank you again for your post, and again, best of luck with your project! Rob Klingberg Wow thanks for that response! That was way more comprehensive than I expected! I'm really looking forward to trying out these lights. Qamqualler We sent your order out today-- let us know what you think when you receive it! Rob, I got the lights and wow are they cool! I will post some pictures in the creations forum. Thank you for including the tubes! !